Jim Bentley salutes the home fans after the draw with Wycombe. Jim Bentley wants his Morecambe players to end the season on a high when they travel to Luton Town on Saturday. The Shrimps signed off their 2016/17 home season in League Two with a 1-1 draw against Wycombe Wanderers on Saturday. Having thanked the fans for their backing during what has been – at times – a tumultuous campaign on and off the pitch, Bentley is hoping a good result on Saturday can act as a spur for better times ahead once the club’s ownership is finally resolved. “This season the fans have shown how good they are and it was a perfect send-off for the last home game,” Bentley said of Saturday’s result. “We can look forward to trying to get something at Luton and finish the season on a positive note. Bentley’s players will head to Kenilworth Road lying 18th in the League Two table. Depending on how Saturday’s results pan out, they could end the season as high as 17th place or as low as 21st. 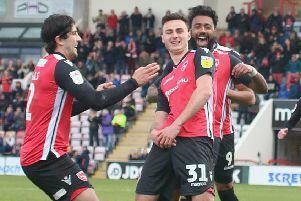 Outsiders may not view that as something to write home about but, given what has happened over the course of the season, Football League survival could be considered a success. The continuing doubts over the club’s ownership, late payment of wages, a threadbare squad and poor training facilities have all combined to test Bentley, his players and the staff to the limit. Bentley said: “It’s been a difficult time and we’ve had some interesting characters around the place which hasn’t made it any easier. “Hopefully, now, things will progress over the next couple of weeks and we can look to a brighter future. “Whatever has gone on, we’ve put points on the board and retaining Football League status is a massive achievement; don’t underestimate that with everything that has gone on. “I can’t thank the fans enough, nor the players, nor the backroom staff, nor the board of directors or the staff who work behind the scenes. “They are a fantastic bunch of people and we can be proud of what we’ve achieved this year. “We want to be better and the lads will probably think that we have underachieved.